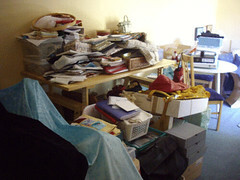 I am a few days behind in my updates on the Sewing Room Makeover, but I am not really that much further along. I thought I would show you the room without the clutter, in and out of the wardrobes! Remember the other picture taken from here? 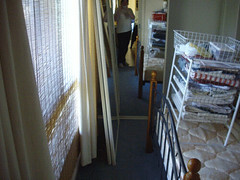 Even with the doors off the wardrobe, it is so much easier to move about! The basket unit from Ikea that you can see on the bed, I had been unable to remove myself, so DH just plonked it on the bed! With the removal of the innards of the wardrobe, we saw just how jerry-fitted the bungalow was! It is fine, and usable, but there were a couple of gaps that the wardrobe parts had been hiding that DH had to quickly fix. Nice entry points for unwelcome critters are now sealed! 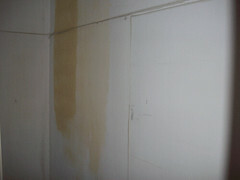 The previous owners, who had completed the conversion of the garage into the bungalow, had not painted in the wardrobe! 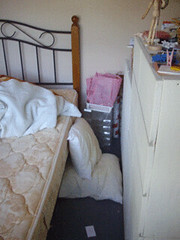 The next picture shows a much tidier bedside. I have yet to completely remove the JUNK on top of the drawers and cupboard, which I will do when I am ready to move these into the wardrobe. At least J can reach the bed now! LOL. I did not prick myself on any of the pins in the quilt that is ready to be quilted! And of course, all the JUNK from the sewing room had to go somewhere – to the front room, or The Needlework Boutique part of the bungalow. Argh! All of this must fit back into the revamped room! That white box contains my wedding dress. Hmm, I would never fit into it now, so I may finally give in and open an Ebay account (am I the last person on Earth who does not have an Ebay account?) so that I can try to sell it. The final picture is of the inside of the wardrobe before it is painted. Do you see the great big yellow streak? Well, it appears that that is about the only painting that had previously been done in the cupboard! And the shelf and other fitted parts had not only been screwed to the wall, but had had also had adhesive applied, which I then needed to remove, resulting in the removal of some of the paper(?) covering the plaster board! Next job – painting – a lovely WHITE! I will paint the wardrobe first, then when I can put the heavy Ivar drawers and cupboard into the wardrobe, I will start on the rest of the walls.